DIY unicorn crafts have really become all the rage lately. And why not? There are so many magical things that you can make in a unicorn theme. From decoration for your DIY unicorn party to fun everyday unicorn crafts for kids, I have a list of 45 magical DIY unicorn crafts that you can make today, and these are great for all ages. I love kid crafts, and there are some great ideas in here for crafts for your birthday parties or just something for the kids to do when it’s too cold to get outside. Everyone loves unicorns, right? These are honestly some of my favorite DIYs. If you are looking for a fun unicorn craft, I have just the list of projects for you. And, there are some great DIY stuffed toys in here that your kids are going to love. If you are decorating a little girl’s bedroom in a unicorn theme, you are going to find some wonderful projects to complete. There are crochet patterns and even a cute DIY unicorn that you can make from an empty toilet paper roll. 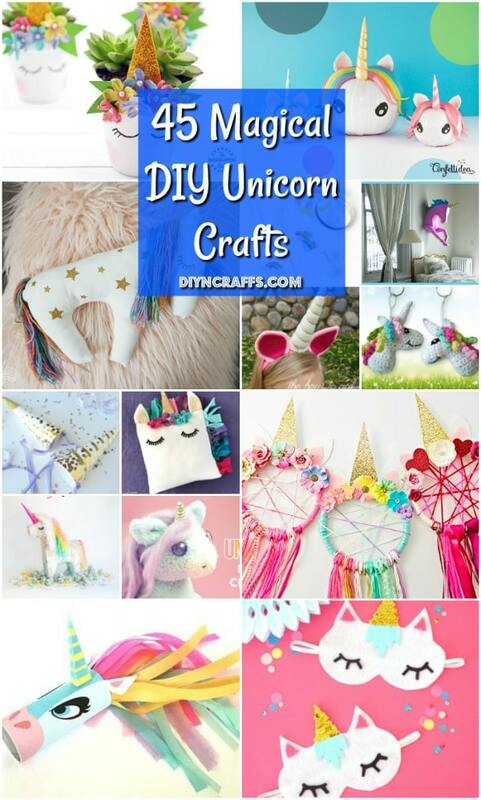 Whatever your reason for wanting unicorn crafts, I am certain that you will find the perfect one in here. And, if you are planning to make your own DIY Halloween costumes this year, there is a great unicorn costume for your little one. There are just so many fun crafts and projects in here – I’m sure you will love them all. 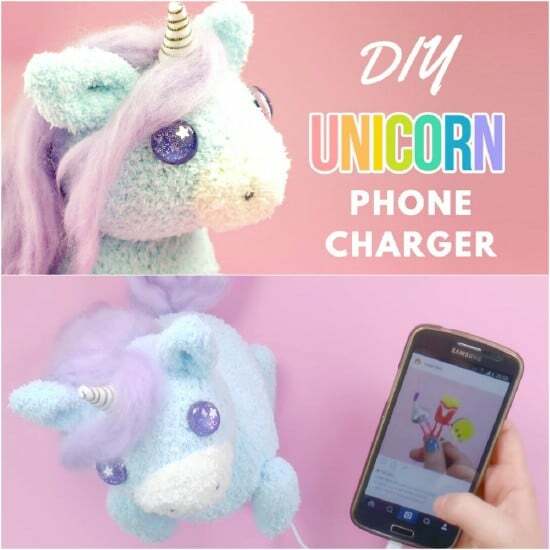 If your little one, or you, has an iPhone or an iPad and also loves unicorns, then this DIY unicorn phone charger is the perfect project. This one doubles as a doll so if you don’t want to charge your phone with it, then you can just make it for its adorableness. You need a sock and some filling and a few other supplies to make this one. It’s pretty easy and it is so adorable when you get it finished. This DIY stuffed unicorn is not actually a balloon animal, but it sure looks like it is. You can do this with fabric, and it turns out so adorable. There is quite a bit of sewing involved, since you are basically turning knit fabric into something that resembles balloons. Your kids are going to love this one. It is so much fun to make and to show off. If your little ones love balloon animals but you want something a bit more permanent, this is it. Dreamcatchers are wonderful. Not only are they decorative, but they provide a wonderful night’s sleep according to their legend. I love these DIY unicorn dreamcatchers. This is a really simple project, and it is a great one for kids to help you with. 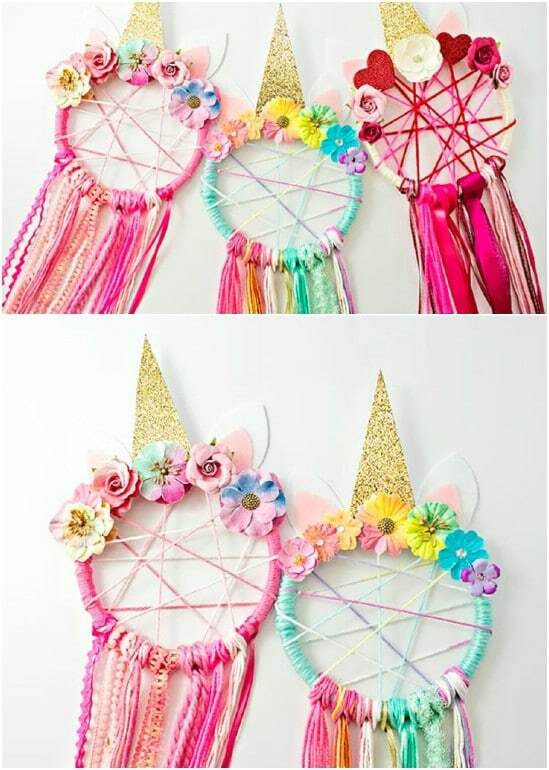 You could even do these for the craft portion of a birthday party and let the little ones take their unicorn dreamcatchers home with them when they’re finished. This unicorn fleece pillow would be perfect for decorating a little girl’s bedroom. And, it is super easy to make. You need to sew a little bit for this one, but the entire project shouldn’t take you longer than a couple of hours. And, if you don’t have a sewing machine you could easily sew this one by hand. You need fleece in a rainbow of colors and just a few other supplies for the details. Emojis are all the rage, just like unicorns, so this project is perfect if you love both. 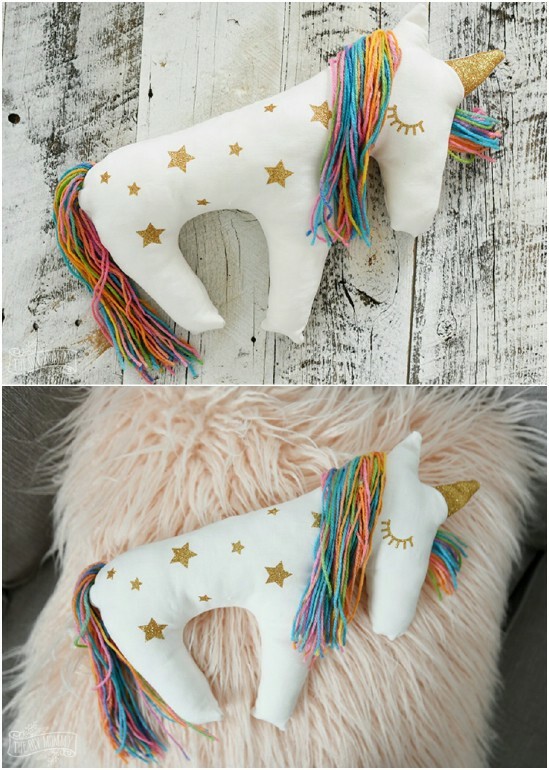 This DIY emoji unicorn cushion is perfect for decorating little girls’ bedrooms, and there is a sewing version and a non-sewing version. So, you can make this one whether you have a sewing machine or not. It’s super easy and so adorable when you get it finished. And, it doesn’t take much time to make. This little DIY unicorn pillow is made using a Cricut machine, but you could just as easily make the little decorations yourself without the machine. The pillow itself is in the shape of a unicorn, which is really fun. The entire project is pretty simple to do. This would be great for a little girl’s bedroom or to give as a gift to anyone who loves unicorns. 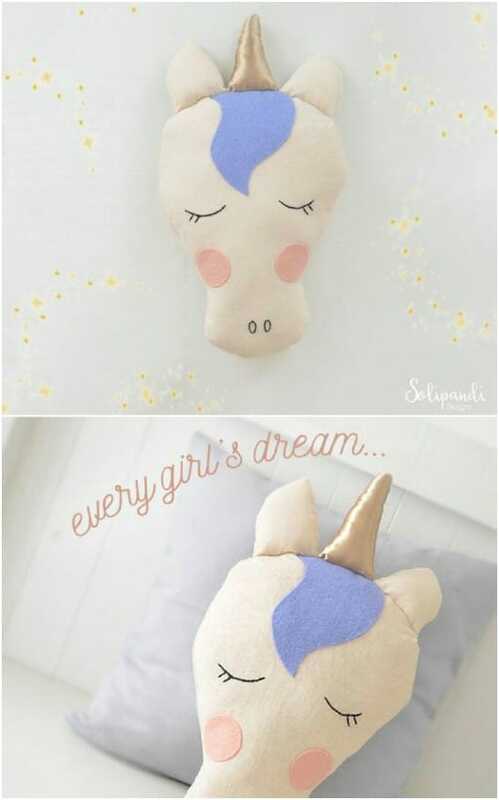 If you are looking for an easy, and inexpensive, way to decorate a little girl’s bedroom in a unicorn theme, then you really want to take a look at this DIY unicorn pillow. I found this amazing pattern on Etsy, and you can get it yourself for just $7.50. Note that you do need to sew this one, but the instructions are super easy to follow. And, you can use leftover fabric to make this if you have any on hand. Little girls, and big ones too, are going to love carrying this adorable little DIY unicorn purse. You make this with any standard plain purse, or you could easily do this with a clutch instead. 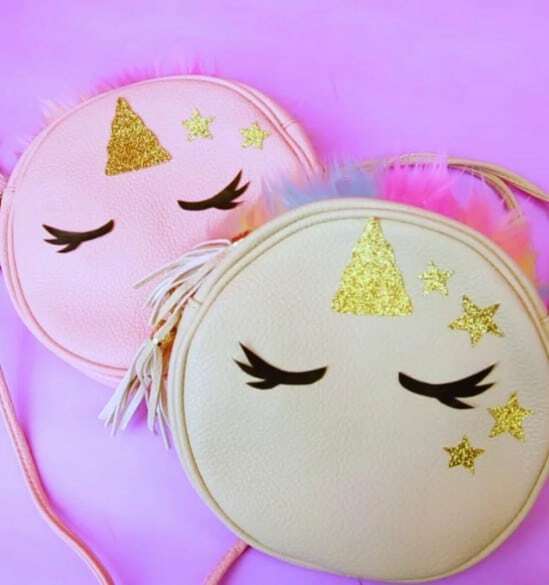 You just add the unicorn details to your otherwise plain purse and you’re all set. This is so easy and will only take you an hour or less to complete. It’s a great gift idea for little girls who love unicorns, too. Are you looking for a DIY unicorn costume for Halloween or just for an upcoming birthday party? Maybe your little one just loves unicorns and wants something for dress up play. Either way, this DIY unicorn costume is perfect. This one is really simple to make, and you use hot glue to hold the details together. That means no sewing! You start with white leggings and a white hoodie and go from there. This DIY drawstring bag is really simple to make, and it fits in with the unicorn theme when you purchase unicorn print material to make it. This is a great little bag for little ones to keep their things in on long road trips or to head out to grandma’s house. You can find unicorn print fabric online or at most hobby and craft stores, and then you just need about an hour or so to put the bag together. If you are planning a unicorn themed birthday party, then this DIY unicorn headband is a must. This is also a great one for Halloween costumes or just general play. To make this one, you need a cheap plastic headband, felt, paper, stuffing for the horn, and a few basic sewing supplies. It’s super simple and looks so great when you get it finished. 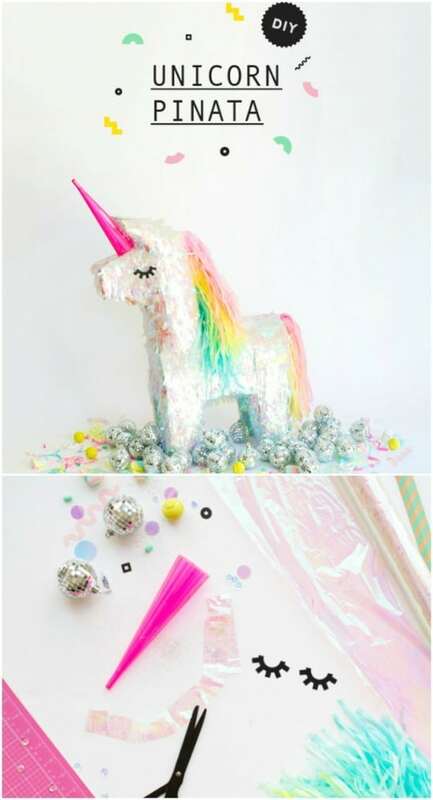 This is also a great craft idea for unicorn themed birthday parties. This is also just a great little DIY headband for anytime. 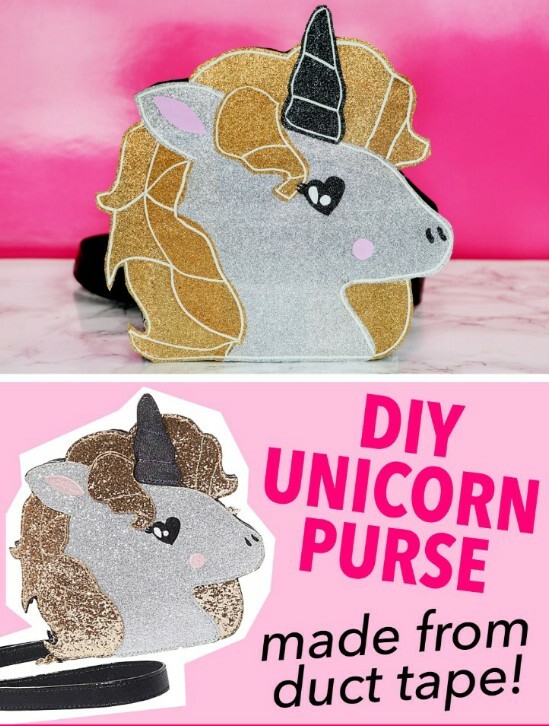 This little DIY unicorn purse is made Betsey Johnson style, and you make it with duct tape! It’s glittery and so gorgeous, and little girls are going to love it. If you are looking for a fun DIY unicorn craft that is also super easy, this is it. You can find all sorts of duct tape colors and styles at Walmart these days. 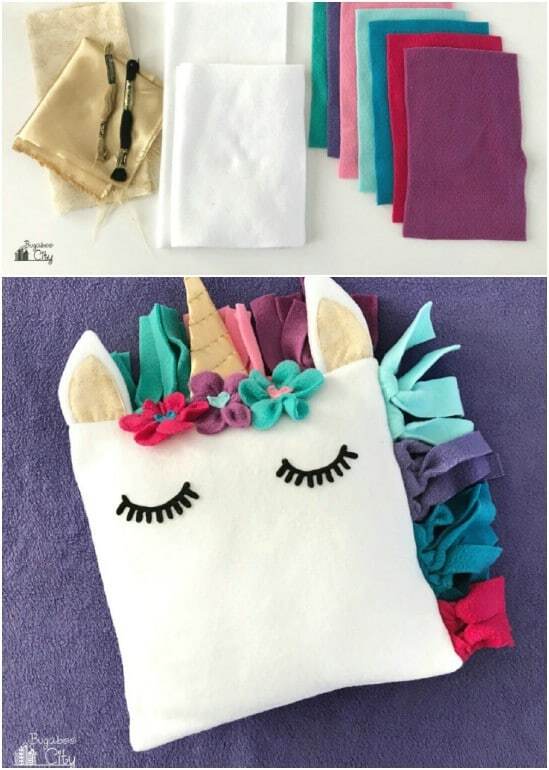 Just grab a few rolls and get to creating this adorable unicorn purse. 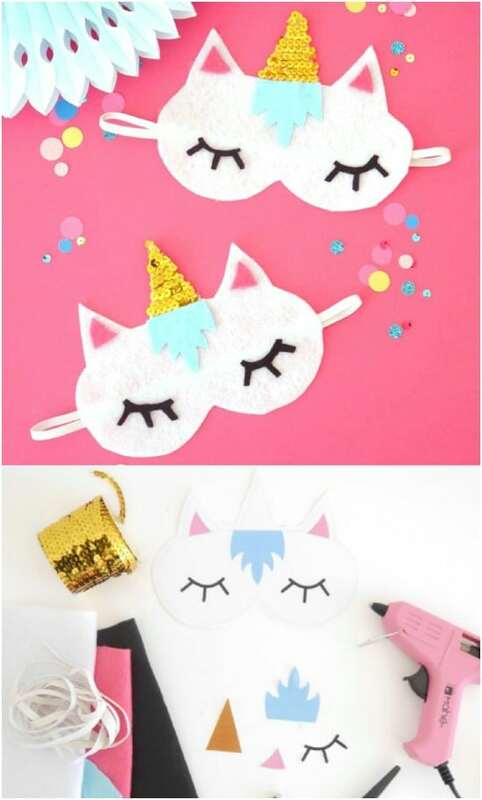 If you have trouble getting your little one to go to sleep, or maybe you are planning a unicorn slumber party, then you definitely want to see these DIY unicorn sleeping masks. There is no sewing involved to make these, and the materials are really inexpensive. They are perfect as party gifts for unicorn birthday parties, especially if you are planning a sleepover. And, they are super easy to make. 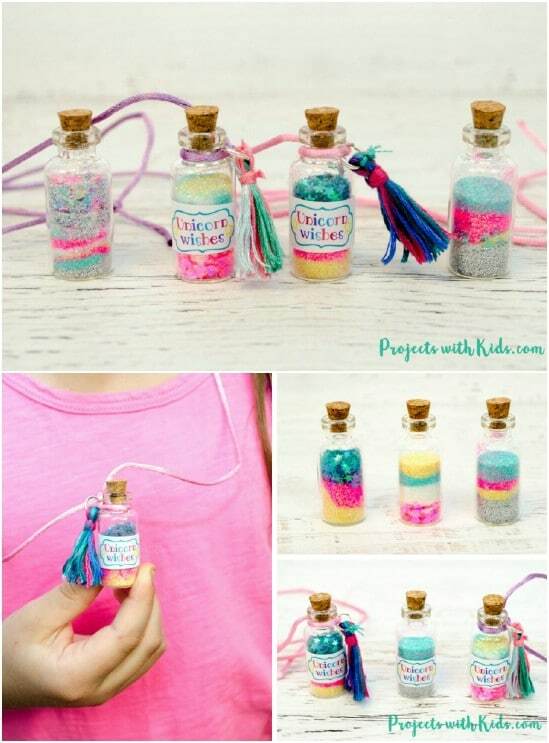 This DIY necklace is the perfect kids’ unicorn craft. It’s basically a vial of unicorn glitter with some colorful tassels, and it could not be easier to make. These are great as party gifts for a unicorn birthday party, or you could set up a crafting table at your party and let the kids make them all by themselves. Either way, they are going to love these. You do use glass bottles for this one, so it’s important to keep the ages of the little ones in mind when you plan around this unicorn craft. 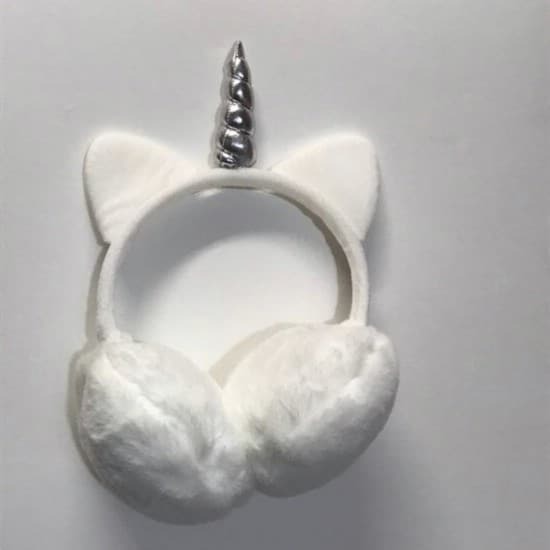 These colorful fleece ear warmers are the perfect accessory for your unicorn lover. They are so easy to make, and you can do them in so many different colors. They’re also perfect for keeping those little ears warm this winter. You start with some fleece fabric and use the pattern to create the headband or ear warmer. Then you just add in the horn and your little one has an adorable unicorn fleece to wear when the weather calls for something warm. 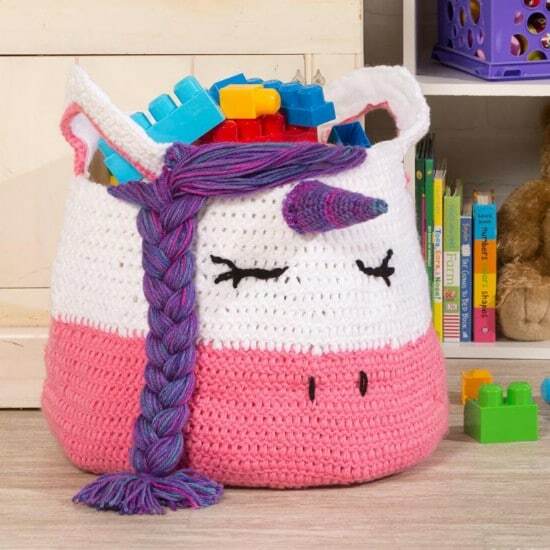 Put those crochet skills to the test with this DIY unicorn yarn bag. This one could also be used as a toy bag, and it is really easy to make. The pattern is listed as a beginner crochet pattern, so you don’t need to know any fancy stitches or be a seasoned crochet enthusiast to make this one. You could even make this your very first crochet project. It’s that easy! 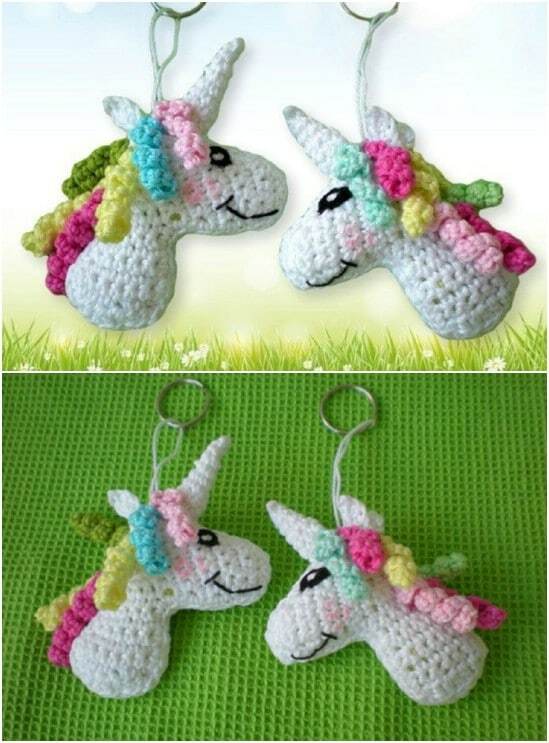 This unicorn keychain is super easy to crochet, even for beginners. I found this adorable pattern on Etsy and you can pick it up for under $3. It shouldn’t take you longer than a couple of hours to complete, because there are multiple colors included. The pattern is really easy to follow, and you don’t need to know any fancy stitches. Once it’s done, you just add the keyring. This would be a great crochet gift for someone special. Here is a great little unicorn craft for kids. If you are looking for something to keep them busy when it’s too cold or rainy to get outside, this is a good one to try. 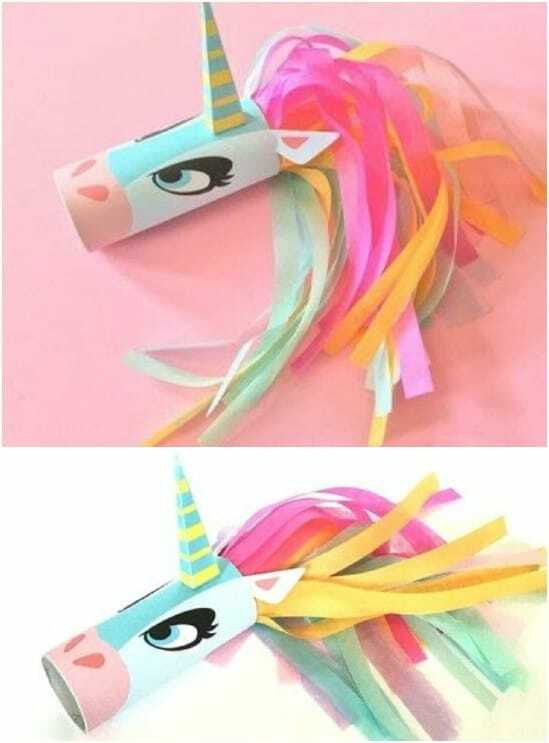 You need an empty toilet paper roll for each unicorn that you want to create and some colorful tissue paper for the mane. Kids are really going to love making their own unicorns, and this one is perfect for adding a craft to a unicorn themed birthday party. If you need inspiration for a DIY valentine box for your little one’s school party, here it is. This DIY unicorn valentine box could not be easier to make, and it’s a unicorn! Little ones are going to adore the design, and it holds so many valentines. Of course, you don’t have to wait until Valentine’s Day to make this one. You could do it for any occasion, and your little one will adore it. 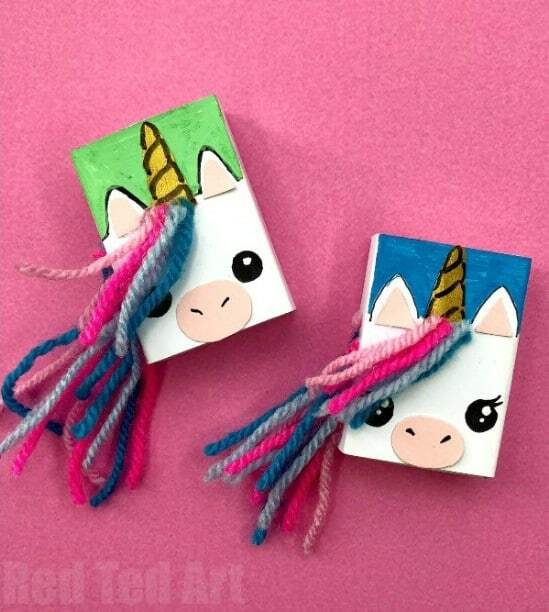 This DIY unicorn project is actually a little book that you make with an empty matchbox. The box holds all of the pages, which your little ones can fill in with drawings or stories. These tiny little unicorn notebooks are perfect for taking along on long trips. Your little ones will have hours of fun filling in their pages, and the books themselves are really simple to make. You can pick up a plain white mug at the Dollar Store or Dollar Tree for a dollar – or sometimes you can get two for a dollar. Use those plain white mugs to create these adorable DIY unicorn mugs that are perfect for gifts or to use yourself. You just need colorful sharpies and some rubbing alcohol to put on the design, and these are great for sipping hot cocoa or coffee or for using as a pencil or pen holder on your desk. So, this DIY unicorn pinata isn’t made completely from scratch. If you have never made your own pinata, don’t worry. This one is super easy. You start with an actual pinata in a donkey shape and you turn that into a gorgeous little unicorn. You can find pinatas at Walmart and most craft stores, and they are pretty inexpensive. Turning that ordinary pinata into a lovely unicorn is really easy and really cheap, too. 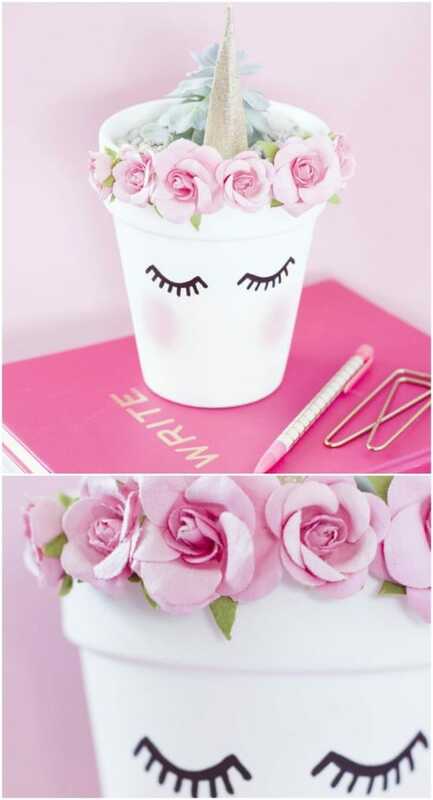 Here is a great idea for a desk decoration for yourself or a girl’s bedroom. 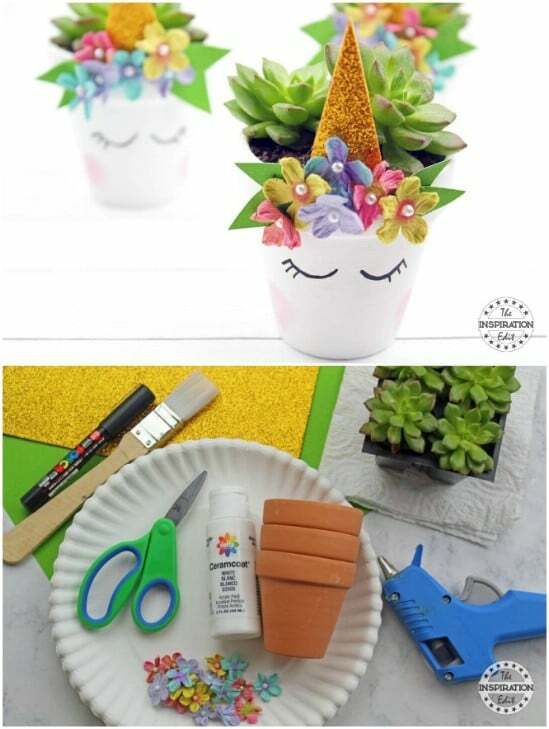 This DIY unicorn planter is really easy to make from a plain terra cotta pot. You just have to paint it white and then add in the details. This would be a lovely gift for anyone you know that loves unicorns, too. It’s really simple to make and definitely a project that you want to add to your DIY planters, and you can display this one indoors or out. Have you ever made your own bath bombs? 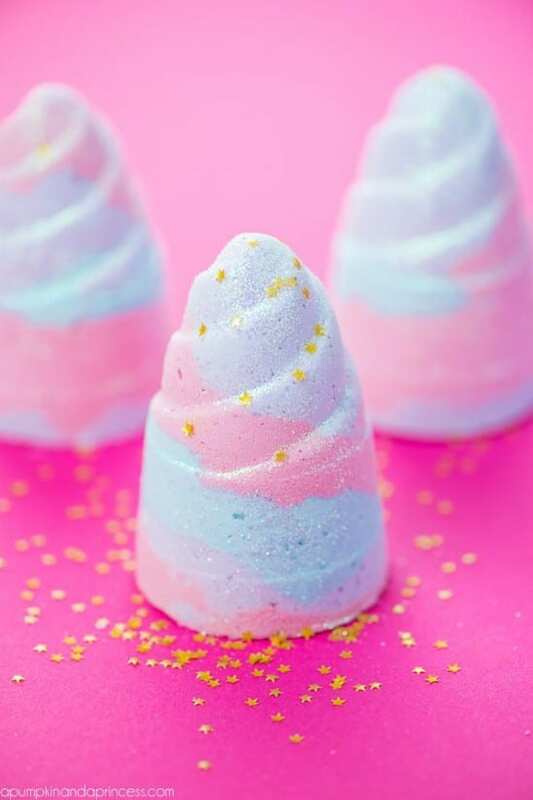 If you love DIY bath bombs, then you are definitely going to love these that look like unicorn horns. These DIY unicorn bath bombs are super easy to make, and they are just as much fun to use as they are to create. You can make this in a popsicle mold, and it really does look just like a colorful unicorn horn. These are great for gifts for any little girl who loves unicorns. So, fall decorating is over, but you definitely want to save this idea for next year. 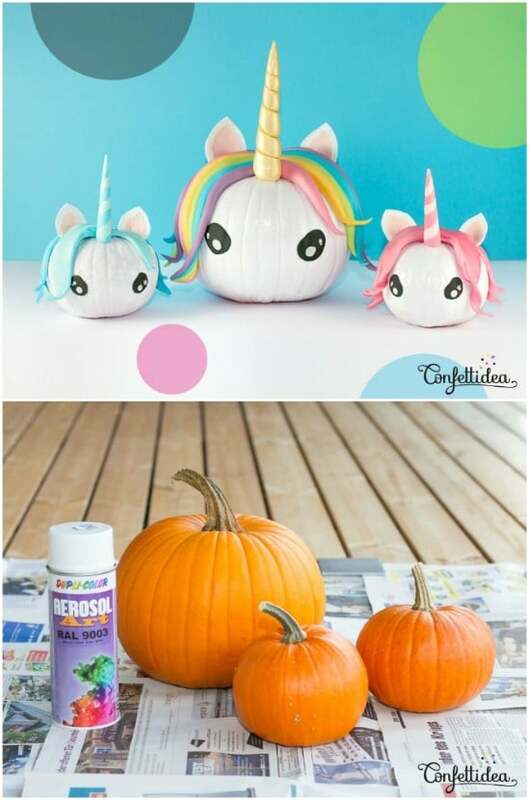 These DIY unicorn pumpkins are gorgeous, and they are super easy to make. You could do these with real pumpkins that you paint white or buy ceramic or plastic pumpkins from the Dollar Store and use those. If you use the plastic or ceramic versions, you could display these all year long. 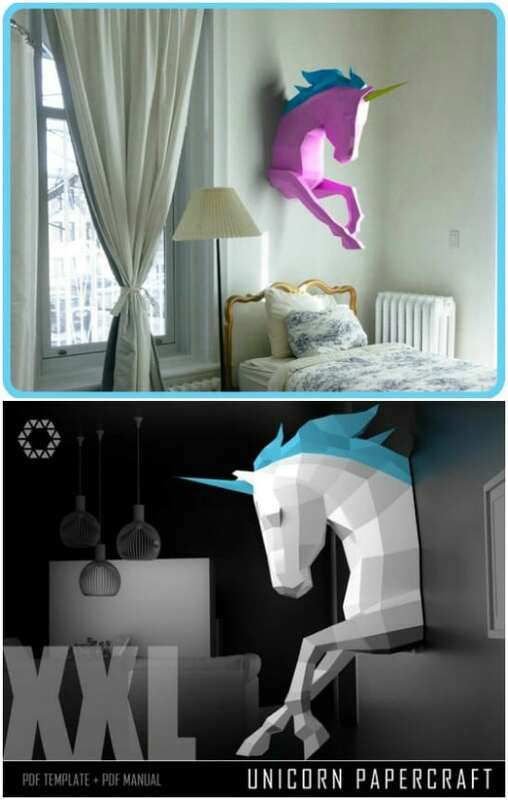 They are perfect for adding some extra unicorn décor to a bedroom or office. We all get stressed out from time to time, right? Even little ones may feel stress with school. This DIY unicorn stress ball is the perfect way to combat that stress. And, this one is as much fun to make as it is to use. You need a balloon to create the actual stress ball, which is then filled with glittery and sparkly goodness that is sure to bring up your mood. Make one of these for your office and have a few at home, too. String art is a really fun project, especially for kids. If you need something for them to do on cold, rainy days, or you are looking for a great craft for a unicorn themed birthday party, here it is. 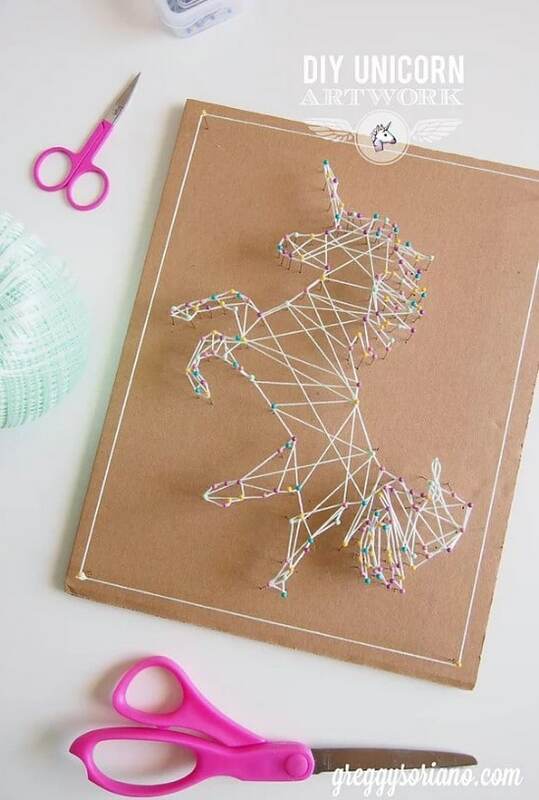 This DIY unicorn string art is really simple and so much fun to make. You just need a piece of cardboard for the base and then some colorful string. You can use embroidery thread for this, which is really inexpensive and comes in so many beautiful colors. These DIY unicorn succulents are the perfect gift for anyone who loves unicorns. They’re also perfect for you to display on your desk or anywhere else in the house. You will need several small terra cotta pots to make these, along with a selection of your favorite succulents. They’re super simple to create, and they are a wonderful way to show off those succulents in your garden, too. Stick ponies are still really popular, which means that this DIY felt unicorn stick pony is going to be super popular with your little one. 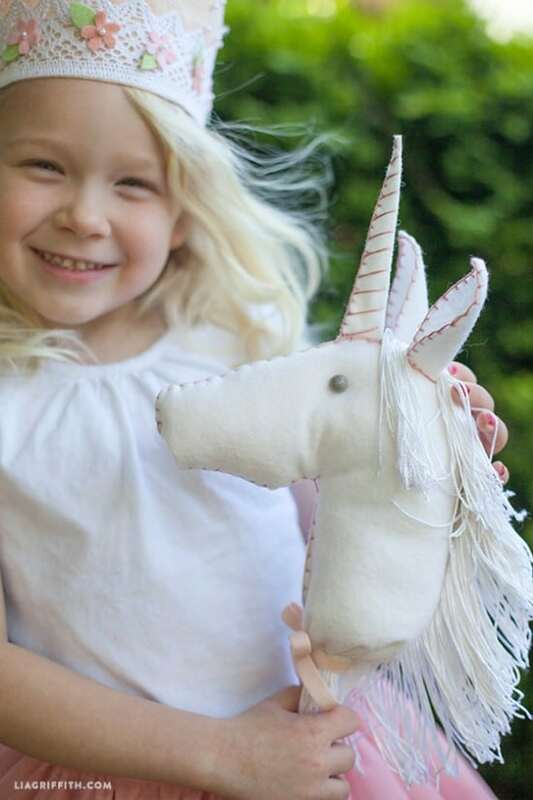 This is so easy to make, and it would be a wonderful gift for any little girl who loves unicorns. The great thing about this one is that you can customize it any way you like. Add in extra colors to the mane or paint the stick rainbow colors. Some little jelly jars and Play-Doh are all you need to make these adorable DIY unicorn party favors. Oh, and you will need a plastic unicorn for each jar that you want to create. You can find plastic unicorn toys at any Dollar Store or Walmart, and they are pretty cheap. Then you just create the glittery Play-Doh, glue the unicorn in place and you are all set for your unicorn party! If you have never tried felting, now is your chance. You can make this adorable felt unicorn, which is super easy and so gorgeous when you get it finished. You need quite a few supplies for this one, so head out to your favorite craft store and pick up wool in different colors. When this one is finished, it makes a colorful and adorable little stuffed unicorn that your little ones are going to love. I loved shrinky dinks when I was younger. That actually hasn’t changed, so I was thrilled when I came across these DIY shrinky dink unicorn pendants. These would be perfect for party crafts, or you could just help your little ones to make them anytime they want something fun to wear. You need plastic, of course, and a selection of colorful markers to create these. If you are planning a unicorn birthday party, then you simply must check out this recipe for rainbow unicorn cookies. These little creatures are adorable, and the recipe is so delicious. You need colorful sour candy pieces to create the rainbow manes, and the rest is simply cutting them out into unicorn shapes and frosting them. 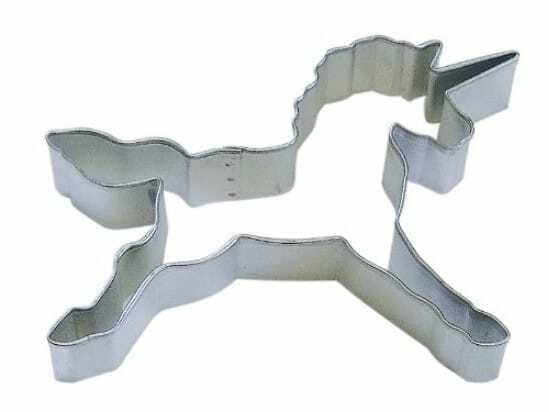 You can pick up unicorn cookie cutters online or in most stores for just a couple of dollars each. If you are looking for inspiration for a unicorn themed bedroom, this DIY stained glass unicorn is a must. These are so easy to make, and they are perfect for decorating a little girl’s bedroom. And since you really don’t use glass to make it, it is perfectly safe as a unicorn birthday party craft. You just need a few basic supplies and a template for cutting out the unicorn shapes. I love DIY stained glass projects! Here is a great little stuffed unicorn pattern that I found on Etsy for just $6.50. 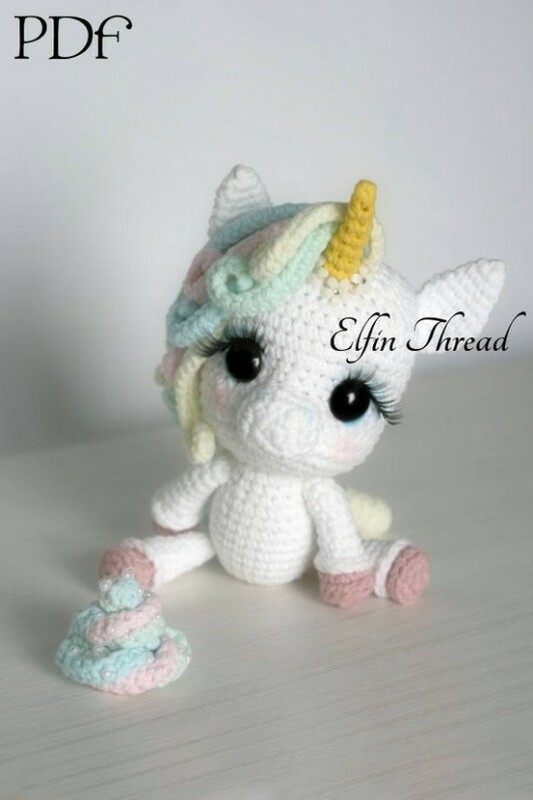 The pattern is so easy to follow, and the unicorn is so adorable when you get it finished. You don’t need to know any fancy stitches to make this one, and you can turn it out in just a couple of hours even if you don’t crochet a lot. These would be wonderful gifts for baby showers or birthday parties. Here is a great unicorn craft for birthday parties. 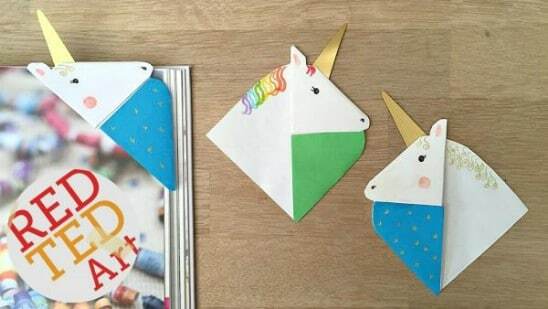 These DIY corner unicorn bookmarks are really easy to create, and kids are going to love them. You need plain white printer paper for the bookmark and then colored pens or sharpies or construction paper to make the colors. They’re super simple and perfect for toddlers and preschoolers to make as a DIY unicorn craft. This project is great for older kids and teenagers. This little DIY stuffed unicorn pencil case would look gorgeous sitting on a kid’s desk in their bedroom, and it is really easy to make. Kids will need to have a few basic sewing skills, and you can help younger children if they want to create this one. The sleepy unicorn design is adorable, and your kids are sure to love it when it’s finished. Here is another wonderful DIY unicorn bookmark that won’t take you long to make. And, your kids are going to love this one. This is a great one for parties – set up a crafting table and let the little ones make their own bookmarks to take home. You just need a few basic crafting supplies for this one, and it is a great way to encourage your unicorn lovers to read in their spare time. If you love projects that let you repurpose plastic bottles, this is the one for you. This adorable unicorn jar is made from an empty two liter soda bottle, or you could use water bottles if you wanted to make smaller versions. These are great for kids to make. They are super simple to do, and the little ones can use the jars for anything from planters to holding pencils or small toys. If you are planning a unicorn birthday party, then these homemade unicorn milkshakes are a must. These are super easy to make and so delicious when they’re done. The key here is in the colors. 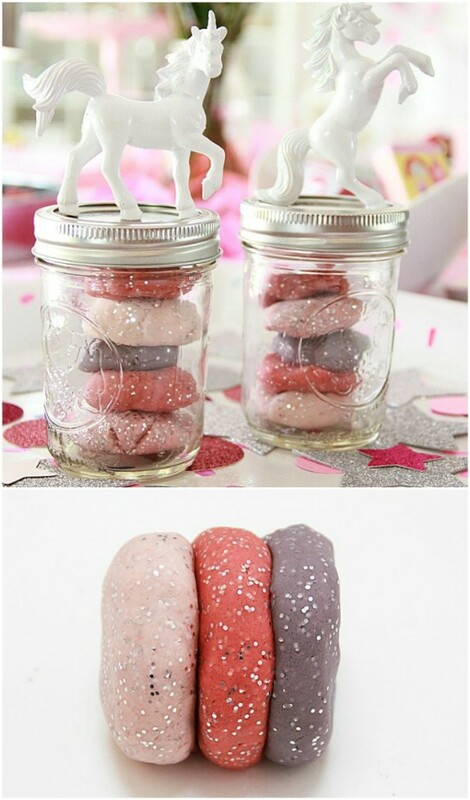 Rim the glasses with some colorful frosting or other colored tasties and add in small marshmallows for design. Then, just fill with your favorite milkshake recipe, and you can add in sprinkles to the top or even throughout the milkshake to really get a rainbow look. 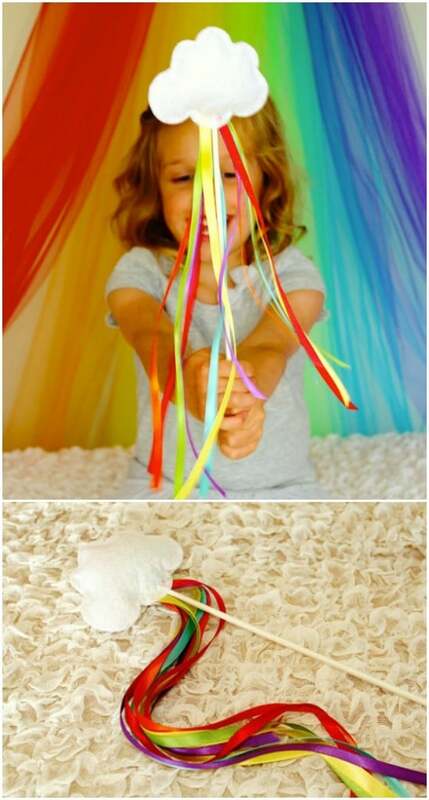 I love how simple these DIY rainbow unicorn wands are to make. These are great for birthday parties, and you only need a few basic craft supplies to create them. You make these with white felt, to create the cloud – or you could turn the top into a unicorn horn. Then, you put it all together with a hot glue gun and add your colorful streamers. It all sits on an extra long popsicle stick or a wooden dowel. If you are looking for the perfect unicorn themed gift, this DIY unicorn spa jar is a great one. This is simply a mason jar filled with unicorn colored items, like maybe a homemade bath bomb or some colorful sugar scrub. Use your imagination when filling it. This is a great gift idea for little girls and women, alike. Anyone who adores unicorns and needs a spa day is really going to appreciate the creativity of this one. 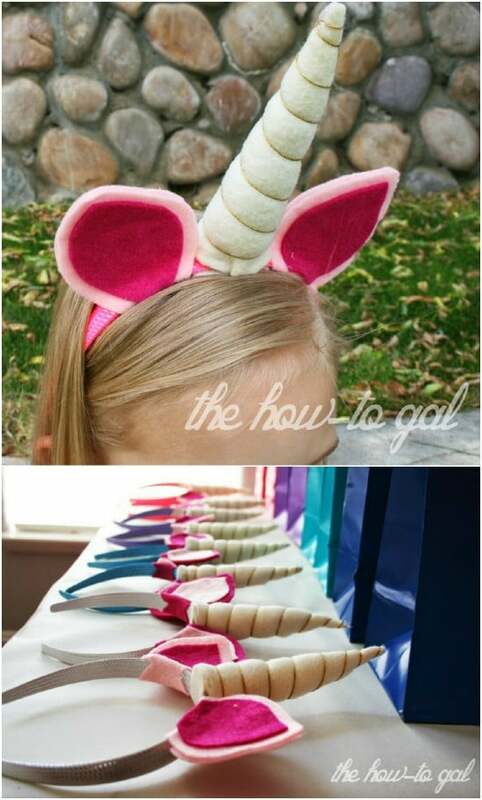 Take some plain old party hats and give them a bit of magic, turning them into these adorable DIY unicorn party horns. These are so easy to make, and they’re cheap to make, too. You just need plain party hats, which you can get anywhere for like a dollar or so for a pack. 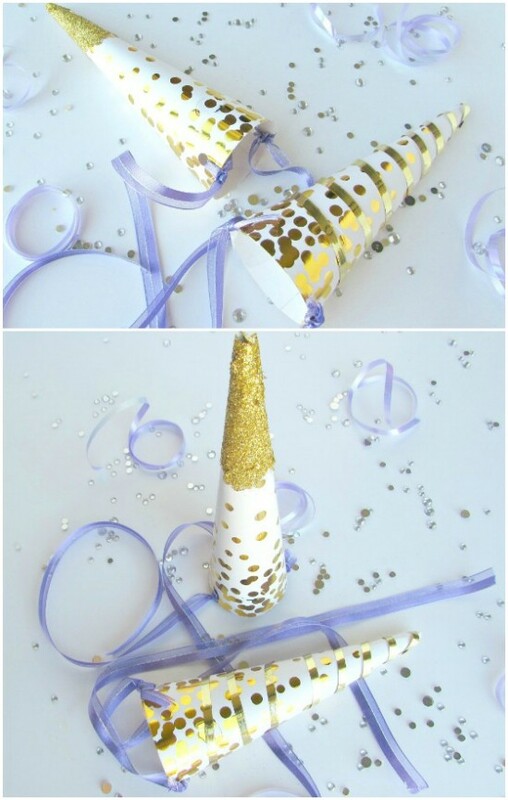 Then, you add in glitter and sparkles to create the perfect unicorn party horns for your DIY unicorn birthday party. This DIY unicorn art is super easy to make. You create this with colored washi tape, which is available in so many colors and designs. 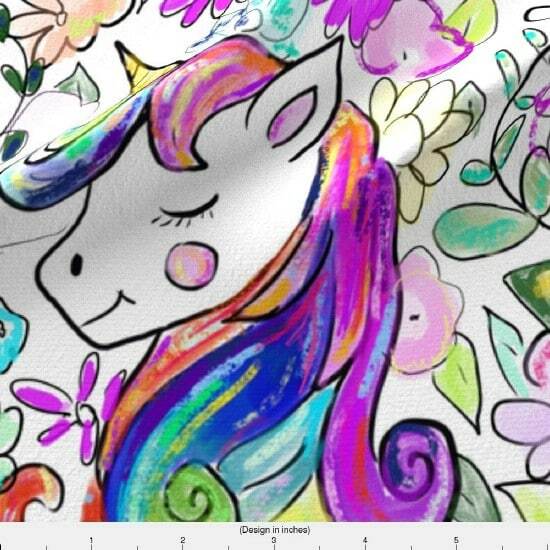 Use the colored tape to create the background for your art and then add in a black or white unicorn that you can cut out of craft or construction paper. Then, frame it, and you have the perfect gift for anyone who loves these mystical creatures. What could possibly be better to decorate a little girl’s unicorn themed bedroom than this amazing DIY unicorn bust? I found the pattern for this on Etsy, and it’s less than $15 for the pattern to create your own paper bust. This is so great, and you could do so many of these in different colors to really decorate a bedroom. I love the creativity of this one and how simple these are to make once you have the pattern.